Today we're celebrating a re-launch of the Graphicat Sketches Blog with a fun blog hop! We've got a great group of ladies whose cards will inspire you today! Other ladies in this hop are brand new to the Graphicat Team, so please be sure to say hello as you hop along! We'd love to have you leave comments along the way... word is that there may be some random prizes from Cheri! The hop started at Cheri's blog, so if you'd like to start at the beginning (or if any links don't work along the way) please visit her for the whole list! Our theme, along with using this fabulous sketch, is anti-valentine's day... I selected one of my fave sentiments for my card, and paired it with a gorgeous patterned paper from Canvas Corp (just discovered their papers, and I'm in love... we've got more coming soon to the store!) and some Tim Holtz dies, as well as a fabulous new "Cadbury Milk Chocolate" brown stain from Lindy's Stamp Gang- a fabulous new product coming soon to Creative Accents- it's so pretty and shimmery and affordable, you guys are gonna LOVE these things! 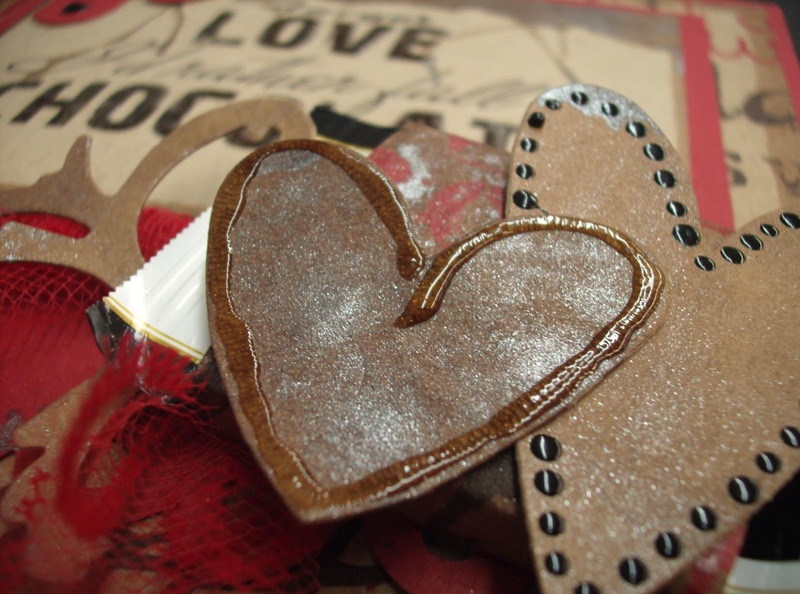 Here's a close up of my little chocolate bundle (there's some Lindt in there... mmmm...) and the hearts coated with the new stain. I added some details with Black Enamel Accents & Crackle Accents from Ranger. If you'd like to continue on the hop, please go visit Shelley! Great card...such a realistic chocolate feel it has. Sorry to hear you are leaving, but best wishes on all your new adventures! Awesome card, love the hearts and use of Lindy's Stamp Gang stain! Fab job! Chocolate is ALWAYS good :) love your card, the hearts and that sentiment! PS Been wonderful having you on the team, your creations are spectacular! Don't do it!! You're doing too well to eat chocolate now!! I love your card! That paper is awesome and all the fun little hearts and ruffles!! Those hearts look good enough to eat girlie! Wow, great card and great, now I want chocolate! LOL! Fabulous card. Love this card especially the hearts, those are sweet! Oh wow this is cool!! 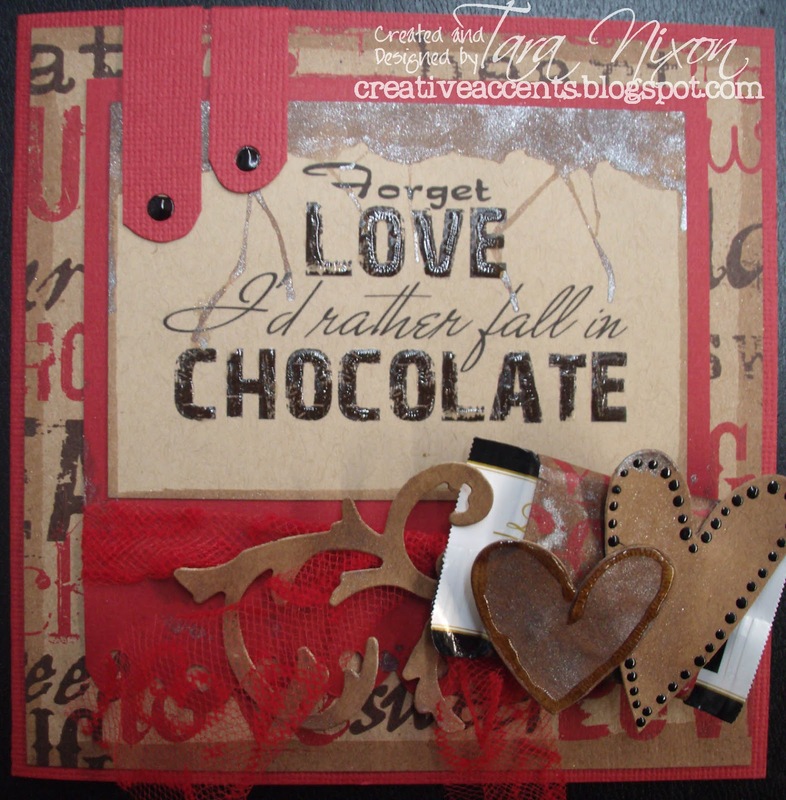 I love the embossed sentiment and the whole red and kraft colors are really very sharp. Love it! Hugs! NOM NOM NOM!! This card is deliciously GREAT!! I love it all, love the red with the brown and the sentiment... chocolate will never let you down! TARA!! I WANT CHOCOLATE NOW!! I have one question??? Does it smell like chocolate too? Cause that would just finish off this perfect card!! Truer words have never been spoken! Great card!